The HIV test checks for HIV 1 & 2 antibodies in the blood. What is this HIV test? This HIV test checks for HIV antibodies and HIV p24 antigen using a 4th generation blood test. Why is an HIV test important? An HIV test can detect an HIV infection. An HIV infection can cause a variety of illnesses and can also infect other people. This HIV Test is a blood test. The HIV test, also known as the HIV blood test, HIV lab test, and human immunodeficiency virus test, screens for the presence of HIV 1 and 2 blood antibodies and antigens. HIV is a lentivirus that was first identified in the 1980s. HIV infections can progress into acquired immunodeficiency syndrome, or AIDS, a condition that causes the immune system to slowly stop functioning. Initially, an infected person may have no symptoms. As the immune system gets weaker, however, AIDS enables infections and cancers that cannot take hold in healthy people to manifest, eventually resulting in death. HIV does its damage by infecting specific cells in the immune system and causing destruction of other ones. This HIV blood test is a fourth-generation HIV lab test that uses an immunoassay methodology as recommended by recent CDC guidelines. Known as an HIV antigen / antibody test, this blood test checks the blood for antibodies to HIV-1 and HIV-2 and for the presence of the p24 antigen. Blood antibodies to HIV-1 and HIV-2 imply that the immune system has been previously exposed to it and has produced antibodies to counteract the exposure. The p24 antigen is a viral protein that makes up a good part of the core of the HIV virus and is detectable in the first few weeks after an infection. The p24 antigen provides earlier information about the possibility of an HIV infection as HIV antibody levels take slightly longer to rise. This form of HIV testing is highly accurate and negative results effectively eliminates HIV exposure if done within the correct timeframe. Currently, subsequent testing for high-probability exposures is recommended at six weeks, three months and six months in the event that the antibody or antigen testing was done too early and blood levels were not yet high enough to be detected. To get an HIV test near you, just order online and get your blood drawn at Quest Diagnostics. 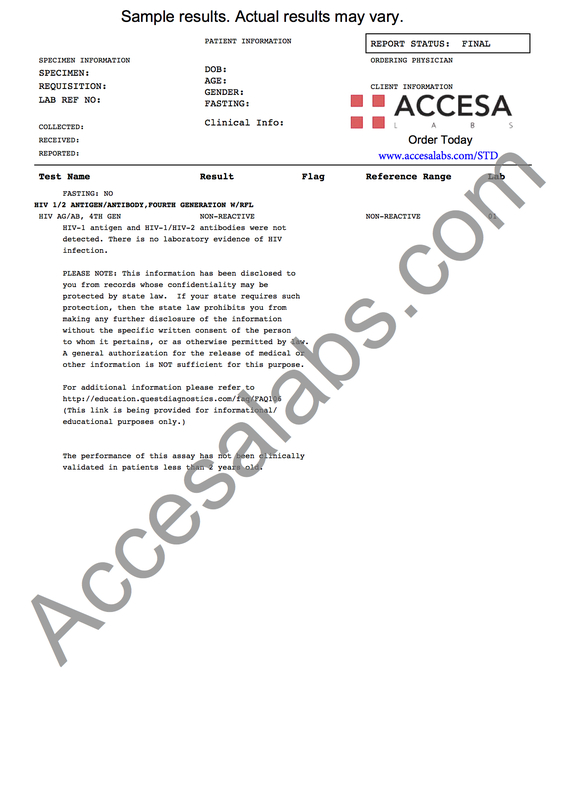 Once the HIV lab report is ready, it will be available for download. As can be seen on the sample HIV lab results above, negative HIV test results will be reported as non-reactive. A positive result suggests a prior exposure to HIV. This HIV test can detect an HIV infection as early as 14 days after exposure. For earlier HIV detection, refer to the HIV-1 RNA test. This HIV test is part of the more comprehensive STD test panel. The CDC estimates that over 1.1 million people in the United States are living wth HIV and that more than 10% of people are unaware that they are positive. Current guidelines suggest that everyone should get an HIV test at least once and that people in higher risk groups should be tested annually. Early HIV diagnosis is beneficial because HIV can be managed effectively with antiretroviral medications and therapies as well as protect potential partners from being exposed. There is currently no effective definitive treatment for HIV. HIV Test at Guaranteed Prices.